next post: What you consume or what you produce? A sovereign national government can run a balanced budget over the business cycle (peak to peak) as long as it accepts that after all the spending adjustments are exhausted that the private domestic balance will mirror the external balance. That means a country running an external deficit will have an increasingly indebted private domestic sector. Note that this question begs the question as to how the economy might get into this situation that I have described using the sectoral balances framework. But whatever behavioural forces were at play, the sectoral balances all have to sum to zero. Once you understand that, then deduction leads to the correct answer. So after simplification (but obeying the equation) we get the sectoral balances view of the national accounts. The private domestic balance (I – S) – positive if in deficit, negative if in surplus. The Budget Deficit (G – T) – negative if in surplus, positive if in deficit. The Current Account balance (X – M) – positive if in surplus, negative if in deficit. These balances are usually expressed as a per cent of GDP but that doesn’t alter the accounting rules that they sum to zero, it just means the balance to GDP ratios sum to zero. A simplification is to add (I – S) + (X – M) and call it the non-government sector. Then you get the basic result that the government balance equals exactly $-for-$ (absolutely or as a per cent of GDP) the non-government balance (the sum of the private domestic and external balances). This is also a basic rule derived from the national accounts and has to apply at all times. To help us answer the specific question posed, the following Table shows a stylised business cycle with some simplifications. The economy is running a surplus in the first three periods (but declining) and then increasing deficits. Over the entire cycle the balanced budget rule would be achieved as the budget balances average to zero. So the deficits are covered by fully offsetting surpluses over the cycle. The simplification is the constant external deficit (that is, no cyclical sensitivity) of 2 per cent of GDP over the entire cycle. You can then see what the private domestic balance is doing clearly. When the budget balance is in surplus, the private balance is in deficit. The larger the budget surplus the larger the private deficit for a given external deficit. As the budget moves into deficit, the private domestic balance approaches balance and then finally in Period 6, the budget deficit is large enough (3 per cent of GDP) to offset the demand-draining external deficit (2 per cent of GDP) and so the private domestic sector can save overall. The budget deficits are underpinning spending and allowing income growth to be sufficient to generate savings greater than investment in the private domestic sector. On average over the cycle, under these conditions (balanced public budget) the private domestic deficit exactly equals the external deficit. As a result over the course of the business cycle, the private domestic sector becomes increasingly indebted. 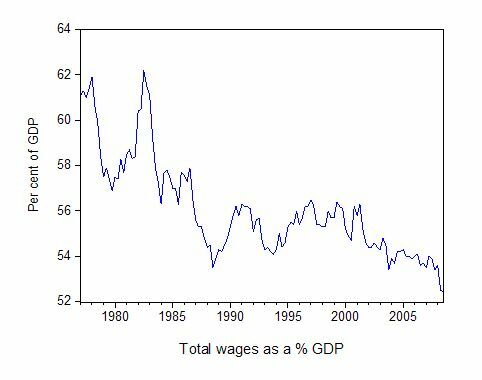 If nominal wages keep pace with inflation which is accelerating at the same rate as labour productivity is growing then there is no shift in the wage share in GDP. The wage share in nominal GDP is expressed as the total wage bill as a percentage of nominal GDP. Economists differentiate between nomimal GDP ($GDP), which is total output produced at market prices and real GDP (GDP), which is the actual physical equivalent of the nominal GDP. We will come back to that distinction soon. To compute the wage share we need to consider total labour costs in production and the flow of production ($GDP) each period. Employment (L) is a stock and is measured in persons (averaged over some period like a month or a quarter or a year. The wage bill is a flow and is the product of total employment (L) and the average wage (w) prevailing at any point in time. Stocks (L) become flows if it is multiplied by a flow variable (W). So the wage bill is the total labour costs in production per period. The wage share is just the total labour costs expressed as a proportion of $GDP – (W.L)/$GDP in nominal terms, usually expressed as a percentage. We can actually break this down further. so it tells us what real output (GDP) each labour unit that is added to production produces on average. We can also define another term that is regularly used in the media – the real wage – which is the purchasing power equivalent on the nominal wage that workers get paid each period. To compute the real wage we need to consider two variables: (a) the nominal wage (W) and the aggregate price level (P). We might consider the aggregate price level to be measured by the consumer price index (CPI) although there are huge debates about that. But in a sense, this macroeconomic price level doesn’t exist but represents some abstract measure of the general movement in all prices in the economy. Macroeconomics is hard to learn because it involves these abstract variables that are never observed – like the price level, like “the interest rate” etc. They are just stylisations of the general tendency of all the different prices and interest rates. Now the nominal wage (W) – that is paid by employers to workers is determined in the labour market – by the contract of employment between the worker and the employer. The price level (P) is determined in the goods market – by the interaction of total supply of output and aggregate demand for that output although there are complex models of firm price setting that use cost-plus mark-up formulas with demand just determining volume sold. We shouldn’t get into those debates here. The inflation rate is just the continuous growth in the price level (P). A once-off adjustment in the price level is not considered by economists to constitute inflation. So the real wage (w) tells us what volume of real goods and services the nominal wage (W) will be able to command and is obviously influenced by the level of W and the price level. For a given W, the lower is P the greater the purchasing power of the nominal wage and so the higher is the real wage (w). We write the real wage (w) as W/P. So if W = 10 and P = 1, then the real wage (w) = 10 meaning that the current wage will buy 10 units of real output. If P rose to 2 then w = 5, meaning the real wage was now cut by one-half. Nominal GDP ($GDP) can be written as P.GDP, where the P values the real physical output. In this area of economics, we often look for alternative way to write this expression – it maintains the equivalence (that is, obeys all the rules of algebra) but presents the expression (in this case the wage share) in a different “view”. Now if you note that (L/GDP) is the inverse (reciprocal) of the labour productivity term (GDP/L). We can use another rule of algebra (reversing the invert and multiply rule) to rewrite this expression again in a more interpretable fashion. Wage share = (W/P)/(GDP/L) – that is, the real wage (W/P) divided by labour productivity (GDP/L). I won’t show this but I could also express this in growth terms such that if the growth in the real wage equals labour productivity growth the wage share is constant. The algebra is simple but we have done enough of that already. That journey might have seemed difficult to non-economists (or those not well-versed in algebra) but it produces a very easy to understand formula for the wage share. Two other points to note. The wage share is also equivalent to the real unit labour cost (RULC) measures that Treasuries and central banks use to describe trends in costs within the economy. Please read my blog – Saturday Quiz – May 15, 2010 – answers and discussion – for more discussion on this point. Now it becomes obvious that if the nominal wage (W) and the price level (P) are growing at the pace the real wage is constant. And if the real wage is growing at the same rate as labour productivity, then both terms in the wage share ratio are equal and so the wage share is constant. The wage share was constant for a long time during the Post Second World period and this constancy was so marked that Kaldor (the Cambridge economist) termed it one of the great “stylised” facts. So real wages grew in line with productivity growth which was the source of increasing living standards for workers. The productivity growth provided the “room” in the distribution system for workers to enjoy a greater command over real production and thus higher living standards without threatening inflation. In this blog – The origins of the economic crisis – I provided these graphs. First, the movement real wages and labour productivity since 1979. Both series are indexed to 100 as at the September quarter 1978. So by September 2008, the real wage index had climbed to 116.7 (that is, around 15 per cent growth in just over 12 years) but the labour productivity index was 179.1. Australia over the last two decades. The trend has been common across the globe during the neo-liberal years and is one of the pre-conditions that explain our current economic crisis. A Eurozone nation that runs a persistent current account deficit cannot sustain rising living standards over time given that the ECB chooses to maintain rigid control of the inflation rate. Unlikely means possible but not probable. The Euro area runs a trade surplus with the rest of the world (Source). However, within the Euro area there are sharp disparities in trade outcomes. You can get access to all the intra and extra EU trade statistics from Eurostat. What you learn is that Germany’s delivered a trade surplus of 134 billion euros in 2009, whereas, trade deficits in Portugal, Greece and Spain, were 18, 28 and 51 billion euros, respectively in 2009. The nations that are running trade deficits are increasing their indebtedness to the surplus nations because the exchange rate cannot adjust. This debt is in a currency that the governments of each country do not issue but which is controlled by the central banking system of the EMU. In times of stress, the cost of accessing this debt rises and ultimately the creditor nations will stop issuing new debt to the external deficit nations. In a floating exchange rate system, the external deficits are always putting downward pressure on the exchange rate which is offset by these capital flows. If the capital flows stop, then the trade deficit will drive a depreciation and that sets in train a process of resolution because it renders the economy more competitive. Its exports become more attractive and its imports become more expensive. In the case of an EMU nation, the only policy approach left to them to avoid persistent intra-EMU deficits is to contract fiscal policy and try to engineer an internal devaluation thereby cutting living standards. With the ECB maintaining an overall deflationary monetary policy stance across the EMU region, this further impacts exacerbates the situation. Higher rates means the debt burden is higher overall which impacts more severely on nations that are already being forced to grow more slowly. So typically the proposition in the question is true. However, the reason there is a possibility that it is false (and thus unlikely) is if, say, Greece could run large and dominant external deficits with non-Euro nations. Then if those nations wished to accumulate financial assets denominated in Euros then they would be willing to extend credit to say Greece. The Greek external deficits would serve to “fund” the desire by the foreigners to have Euros and they would be willing, in return, to net ship real goods and services to Greece. This scenario is highly improbable though. Europe – bailout or exit? Not the EMF … anything but the EMF! A nation that manages its currency via a currency board (for example, Estonia and Latvia) has to have sufficient foreign reserves to match the outstanding central bank liabilities (reserves and cash outstanding). Under this arrangement it can always guarantee 100 per cent convertibility but has to endure deflationary tendencies unless it runs external surpluses. In a currency board system, the central bank only creates liabilities (reserves, currency or loans) if it has gold or foreign currency reserves to match. The other characteristics is that the central bank pegs the national currency at a fixed rate to some other foreign currency (or currencies if a basket is used). In this way, the central bank guarantees that there is 100 per cent convertibility of its own currency into the currency that it is pegged against given that the local currency is fully backed by reserves in the other currency. The currency board proponents argue that by maintaining currency convertibility and a fixed exchange rate it generates confidence in the local currency which they argue stabilises the economy. The central bank stands by to guarantee this convertibility at a pegged exchange rate against the so-called anchor currency. So this part of the proposition outlined in the question is true. Currency board systems also typically ban the central bank from lending to the treasury which forces government to fully fund its fiscal policy spending from the private bond markets. A further characteristic which is often implemented is that the central bank does not try to manage reserves and thus allows the overnight interest rate and the term structure (the longer rates on the yield curve) to be purely market-determined. But if banks face a squeeze on their reserves (in the domestic currency) then the only way this can be resolved is for interest rates to rise to attract the funds. All these characteristics are present in the Estonian case. As an aside: a pure currency board arrangement involves the creation of a separate institute (called the “currency board”) which is independent of government (particularly the central bank). Its sole function is to provide foreign reserves to match the central bank liabilities. Modern currency boards, however, blur this distinction and allow the central bank to serve both functions. Estonia pegs its currency at 15.60 krooni per Euro (after joining the European Exchange Rate (ERM) system in June 2004. Latvia pegs its currency at 0.71 lat per Euro and joined the ERM in 2005. Estonia initially pegged against the German mark when the Soviet system collapsed and they abandoned the rouble. Latvia switched their currency anchor from the IMF Special Drawing Rights bask to the Euro on January 1, 2005. So Estonia and Latvia are both running currency systems similar to Argentina in the 1990s which ultimately collapsed and led to its default in 2001 (Argentina pegged against the US dollar). A currency board thus requires that a nation always have sufficient foreign reserves to ensure at least 100 per cent convertibility of the monetary base (reserves and cash outstanding). And most importantly it forces the treasury to run tight fiscal policy because it is always subject to the discipline of the private domestic bond markets. The currency board arrangement in Estonia only guarantees 100 per cent convertibility of the monetary base. So it does not cover the broader monetary expansion that the banks generate by lending. In this context, there are problems when a financial panic occurs which leads to a bank run. If the depositors try to convert their demand deposits into the reserve currency the banks have a problem. They can use their own store of foreign currency reserves or borrow the currency in international markets. But both these options are short-term at best and when exhausted the crisis becomes critical. The problem stems from the fact that the central bank does not pay a lender of last resort role to the commercial banks in this system. Now has does external trade impact on a nation running a currency board – which addresses the second part of the question? A nation running a currency board can only issue local currency in proportion with the foreign currency it holds in store (at the fixed parity). If such a nation runs an external surplus, then reserve deposits of foreign currency rise and the central bank can then expand the monetary base. Currency board nations are heavily dependent on successful export-led growth strategies with suppressed domestic (private and public) consumption. A nation running a currency board can run external deficits (on the current account) for a time as long as their are sufficient foreign reserves so that the central bank does not need to contract the monetary base (its liabilities). In particular, if investment is targeted at productive ventures building extra export capacity and if the nation has enough foreign reserves then a current account deficit for a time can be beneficial in the longer term. With an external deficit, the monetary base has to contract (so no sterilisation of the reserve outflow) which forces up interest rates because there is a dearth of bank reserves to keep the payments system running. While the higher rates may attract foreign capital inflow they are also deflationary. Proponents of this arrangement argue that the deflation starts a process of internal devaluation (wages and prices fall) and increase the competitiveness of the export sector. So exactly what the EMU want Ireland and Greece etc to do. But it is clear that currency board arrangements, which eliminate the capacity of the central bank to run discretionary monetary policy, lead to pro-cyclical policy outcomes. So in boom times, with exports strong, the monetary base expands and interest rates fall. So monetary policy reinforces the demand boom. But if exports fall and thus aggregate demand weakens and/or foreign capital outflow occurs then the monetary base contracts and interest rates rise therefore causing a further contraction. Moreover, when times are bad, the treasury may not be able to fund its current budget position (if in deficit) and so fiscal policy has to contract which worsens the situation. Currency boards collapse when there is a major collapse in export growth and hence a loss of capacity to build foreign currency reserves and support local demand. The problem is that in those cases a crisis quickly follows because the economy has engineer a sharp domestic contraction to reduce imports but also runs out of reserves and has to default on foreign currency debt (either public or private). It is a recipe for disaster. Overall, the answer is true. From the perspective of Modern Monetary Theory (MMT), mass unemployment can arise from workers demanding too high a nominal wage in relation to the inflation rate. In this blog – What causes mass unemployment? – I outline the way aggregate demand failures causes of mass unemployment and use a simple two person economy to demonstrate the point. I also presented the famous Keynes versus the Classics debate about the role of real wage cuts in stimulating employment that was well rehearsed during the Great Depression. The debate was multi-dimensioned but the role of wage flexibility was a key aspect. In the classical model of employment determination, which remains the basis of mainstream textbook analysis, cuts in the nominal wage will increase employment because it is considered they will reduce the real wage. The mainstream textbook model assumes that economies produce under the constraint of the so-called diminishing marginal product of labour. So adding an extra worker will reduce productivity because they assume the available capital that workers get to use is fixed in the short-run. This assertion which does not stack up in the real world, yields the downward sloping marginal product of labour (the contribution of the last worker to production) relationship in the textbook model. Then profit maximising firms set the marginal product equal to the real wage to determine their employment decisions. They do this because the marginal product is what the last worker produces (at the margin) and the real wage is what the worker costs in real terms to hire. So when they have screwed the last bit of production out of the last worker hired and it equals the real wage, they have thus made “real gains” on all previous workers employed and cannot do any better – hence, they are said to have maximised profits. Labour demand is thus inverse to the real wage. As the real wage rises, employment falls in this model because the marginal product falls with employment. The simplest version is that labour supply in the mainstream model (and complex versions don’t add anything anyway) says that households equate the marginal disutility of work (the slope of the labour supply function) with the real wage (indicating the opportunity cost of leisure) to determine their utility maximising labour supply. So in English, it is assumed that workers hate work and but like leisure (non-work). They will only go to work to get an income and the higher the real wage the more work they will supply because for each hour of labour supplied their prospective income is higher. Again, this conception is arbitrary and not consistent with countless empirical studies which show the total labour supply is more or less invariant to movements in the real wage. Other more complex variations of the mainstream model depict labour supply functions with both non-zero real wage elasticities and, consistent with recent real business cycle analysis, sensitivity to the real interest rate. All ridiculous. Ignore them! In the mainstream model, labour market clearing – that is when all firms who want to hire someone can find a worker to hire and all workers who want to work can find sufficient work – requires that the real wage equals the marginal product of labour. The real wage will change to ensure that this is maintained at all times thus providing the classical model with continuous full employment. So anything that prevents this from happening (government regulations) will create unemployment. If a worker is “unemployed” then it must mean they desire a real wage that is excessive in relation to their productivity. The other way the mainstream characterise this is that the worker values leisure greater than income (work). The equilibrium employment levels thus determine via the technological state of the economy (productivity function) the equilibrium (or full employment) level of aggregate supply of real output. So once all the labour markets are cleared the total level of output that is produced (determined by the productivity levels) will equal total output or GDP. It was of particular significance for Keynes that the classical explanation for real output determination did not depend on the aggregate demand for it at all. He argued that firms will not produce output that they do not think they will sell. So for him, total supply of GDP must be determined by aggregate demand (which he called effective demand – spending plans backed by a willingness to impart cash). In the General Theory, Keynes questioned whether wage reductions could be readily achieved and was sceptical that, even if they could, employment would rise. The adverse consequences for the effective demand for output were his principal concern. So Keynes proposed the revolutionary idea (at the time) that employment was determined by effective monetary demand for output. Since there was no reason why the total demand for output would necessarily correspond to full employment, involuntary unemployment was likely. Keynes revived Marx’s earlier works on effective demand (although he didn’t acknowledge that in his work – being anti-Marxist). What determined effective demand? There were two major elements: the consumption demand of households, and the investment demands of business. So demand for aggregate output determined production levels which in turn determined total employment. Keynes model reversed the classical causality in the macroeconomy. Demand determined output. Production levels then determined employment based on the current level of productivity. The labour market is then constrained by this level of employment demand. At the current money wage level, the level of unemployment (supply minus demand) is then determined. The firms will not expand employment unless the aggregate constraint is relaxed. Keynes also argued that in a recession, the real wage might not fall because workers bargain for money or nominal wages, not real wages. The act of dropping money wages across the board would also reduce aggregate demand and prices would also fall. So there was no guarantee that real wages (the ratio of wages to prices) would therefore fall. They may rise or stay about the same. Falling prices might, however, depress business profit expectations and so cut into demand for investment. This would actually reduce the demand for workers and prevent total employment from rising. The system interacts with itself, and an equilibrium of full employment cannot be achieved within the labour market. Keynes also claimed that in a recession it should be clear that the problem is not that the real wage is too high, but rather that the prices are too low (as prices fall with lower production). However, in Keynes’ analysis, attempting to cut real wages by cutting nominal wages would be resisted by the workers because they will not promote higher employment or output and also would imperil their ability to service their nominal contractual commitments (like mortgages). The argument is that workers will tolerate a fall in real wages brought about by prices rising faster than nominal wages because, within limits, they can still pay their nominal contractual obligations (by cutting back on other expenditure). A more subtle point argued by Keynes is that wage cut resistance may be beneficial because of the distribution of income implications. If real wages fall, the share of real output claimed by the owners of capital (or non-labour fixed inputs) rises. Assuming such ownership is concentrated in a few hands, capitalists can be expected to have a higher propensity to save than the working class. If so, aggregate saving from real output will increase and aggregate demand will fall further setting off a second round of oversupply of output and job losses. It is also important to differentiate what happens if a firm lowers its wage level against what happens in the whole economy does the same. This relates to the so-called interdependence of demand and supply curves. The mainstream model claims that the two sides of the market are independent so that a supply shift will not cause the demand side of the market to shift. So in this context, if a firm can lower its money wage rates it would not expect a major fall in the demand for its products because its workforce are a small proportion of total employment and their incomes are a small proportion of total demand. If so, the firm can reduce its prices and may enjoy rising demand for its output and hence put more workers on. So the demand and supply of output are independent. However there are solid reasons why firms will not want to behave like this. They get the reputation of being a capricious employer and will struggle to retain labour when the economy improves. Further, worker morale will fall and with it productivity. Other pathologies such as increased absenteeism etc would accompany this sort of firm behaviour. But if the whole economy takes a wage cut, then while wage are a cost on the supply side they are an income on the demand side. So a cut in wages may reduce supply costs but also will reduce demand for output. In this case the aggregate demand and supply are interdependent and this violates the mainstream depiction. This argument demonstrates one of the famous fallacies of composition in mainstream theory. That is, policies that might work at the micro (firm/sector) level will not generalise to work at the macroeconomic level. There was much more to the Keynes versus the Classics debate but the general idea is as presented. MMT integrates the insights of Keynes and others into a broader monetary framework. But the essential point is that mass unemployment is a macroeconomic phenomenon and trying to manipulate wage levels (relative to prices) will only change output and employment at the macroeconomic level if changes in demand are achieved as saving desires of the non-government sector respond. It is highly unlikely for all the reasons noted that cutting real wages will reduce the non-government desire to save. MMT tells us that the introduction of state money (the currency issued by the government) introduces the possibility of unemployment. There is no unemployment in non-monetary economies. As a background to this discussion you might like to read this blog – Functional finance and modern monetary theory . MMT shows that taxation functions to promote offers from private individuals to government of goods and services in return for the necessary funds to extinguish the tax liabilities. So taxation is a way that the government can elicit resources from the non-government sector because the latter have to get $s to pay their tax bills. Where else can they get the $s unless the government spends them on goods and services provided by the non-government sector? A sovereign government is never revenue constrained and so taxation is not required to “finance” public spending. The mainstream economists conceive of taxation as providing revenue to the government which it requires in order to spend. In fact, the reverse is the truth. Government spending provides revenue to the non-government sector which then allows them to extinguish their taxation liabilities. So the funds necessary to pay the tax liabilities are provided to the non-government sector by government spending. It follows that the imposition of the taxation liability creates a demand for the government currency in the non-government sector which allows the government to pursue its economic and social policy program. The non-government sector will seek to sell goods and services (including labour) to the government sector to get the currency (derived from the government spending) in order to extinguish its tax obligations to government as long as the tax regime is legally enforceable. Under these circumstances, the non-government sector will always accept government money because it is the means to get the $s necessary to pay the taxes due. This insight allows us to see another dimension of taxation which is lost in mainstream economic analysis. Given that the non-government sector requires fiat currency to pay its taxation liabilities, in the first instance, the imposition of taxes (without a concomitant injection of spending) by design creates unemployment (people seeking paid work) in the non-government sector. The unemployed or idle non-government resources can then be utilised through demand injections via government spending which amounts to a transfer of real goods and services from the non-government to the government sector. In turn, this transfer facilitates the government’s socio-economics program. While real resources are transferred from the non-government sector in the form of goods and services that are purchased by government, the motivation to supply these resources is sourced back to the need to acquire fiat currency to extinguish the tax liabilities. So it is now possible to see why mass unemployment arises. It is the introduction of State Money (defined as government taxing and spending) into a non-monetary economy that raises the spectre of involuntary unemployment. As a matter of accounting, for aggregate output to be sold, total spending must equal the total income generated in production (whether actual income generated in production is fully spent or not in each period). Involuntary unemployment is idle labour offered for sale with no buyers at current prices (wages). Unemployment occurs when the private sector, in aggregate, desires to earn the monetary unit of account through the offer of labour but doesn’t desire to spend all it earns, other things equal. As a result, involuntary inventory accumulation among sellers of goods and services translates into decreased output and employment. In this situation, nominal (or real) wage cuts per se do not clear the labour market, unless those cuts somehow eliminate the private sector desire to net save, and thereby increase spending. So we are now seeing that at a macroeconomic level, manipulating wage levels (or rates of growth) would not seem to be an effective strategy to solve mass unemployment. MMT then concludes that mass unemployment occurs when net government spending is too low. To recap: The purpose of State Money is to facilitate the movement of real goods and services from the non-government (largely private) sector to the government (public) domain. Government achieves this transfer by first levying a tax, which creates a notional demand for its currency of issue. To obtain funds needed to pay taxes and net save, non-government agents offer real goods and services for sale in exchange for the needed units of the currency. This includes, of-course, the offer of labour by the unemployed. The obvious conclusion is that unemployment occurs when net government spending is too low to accommodate the need to pay taxes and the desire to net save. This analysis also sets the limits on government spending. It is clear that government spending has to be sufficient to allow taxes to be paid. In addition, net government spending is required to meet the private desire to save (accumulate net financial assets). It is also clear that if the Government doesn’t spend enough to cover taxes and the non-government sector’s desire to save the manifestation of this deficiency will be unemployment. Keynesians have used the term demand-deficient unemployment. In MMT, the basis of this deficiency is at all times inadequate net government spending, given the private spending (saving) decisions in force at any particular time. Shift in private spending certainly lead to job losses but the persistent of these job losses is all down to inadequate net government spending. But in terms of the question – after all that – it is clear that excessive real wages could impinge on the rate of profit that the capitalists desired and if they translate that into a cut back in investment then aggregate demand might fall. Note: this explanation has nothing to do with the standard mainstream textbook explanation. It is totally consistent with MMT and the Keynesian story – output and employment is determined by aggregate demand and anything that impacts adversely on the latter will undermine employment. Its a bit incorrect to say that the monetary base shrinks or expands and that the currency board can’t do much about this and that overnight and short term rates are “market determined”. Both the Eesti Pank and the Latvijas Banca have their payments systems connected to the Euro Zone’s TARGET-2. Their short term rate are thus related to the ECB’s policy but the two currency boards have a few things at their discretion. In the case of the Estonian Currency Board – Eesti Pank, if settlement balances are lost to the Eurosystem, they can borrow it back from banks having accounts at the NCBs. If there are residuals, there is a “Forex Window” ref_http://www.eestipank.info/pub/en/yldine/pank/rahasysteem/yldalused/valuuta.html where the Board helps banks maintain reserve requirements. The purchase/sale of the kroon for the euro without any limitations and transaction fees . . . These nations must be heavily export dependent but no falling of interest rates happen if say the ECB is targeting a rate of 5% and Latvia’s and Estonia’s export to the Euro Zone is booming. The two currency boards can target an interest rate different from 5% like 4.875% or 5.125%. In the case of banks with accounts at the Estonian Currency Board – Eesti Pank, if settlement balances are lost to the Eurosystem, they can borrow it back from banks having accounts at the NCBs. Even in the Gold Standard, not sure if “money” was convertible to Gold. Central banks may have had less Gold in their balance sheets compared to the monetary base. Even in the present system, the deposits are not fully insured. In the US, it was $100,000 till the crisis and changed to $250,000. Also this may be only for household deposits. Not sure. In other countries not sure what the system is. Some may not even have it. At any rate, even if full insurance exists and if the public starts demanding currency notes and is adamant about it, banks have to borrow from the central bank and give collateral. The central bank may not accept all collateral and the value of the collateral itself may start falling. In such a case, the adamance of the public to obtain currency notes may not be satisfied. “So after simplification (but obeying the equation) we get the sectoral balances view of the national accounts. This way all deficits are negative numbers. -20 = +20 + private domestic balance of -40. -20 means a current account deficit. +20 means a gov’t surplus. -40 means a private deficit (going into debt). Should that be “… at the [same] pace …”? Does that mean in this example that labor productivity is 0 (zero)? I’m a bit confused about question 2. I follow the explanation to the point where Wage Share = (W/P) / Productivity. Now probably it’s just my English comprehension that is a bit off (I’m not a native speaker), but I read the question as nominal wages growing at the same rate as P (“nominal wages keep pace with inflation”), so the real wage W/P stays the same, while at the same time Productivity grows at the same rate. In that case, the Wage Share would fall, wouldn’t it? All this makes much more sense if the question states that real wage is rising at the same rate as labour productivity, but I just don’t see where in the question this is stated. I would really appreciate if somebody could explain how the question can be interpreted to say that real wage is rising. Thanks! Not if labor productivity is 0 (zero)? Hence, my question. Let’s stick some numbers in for question #2. Here is one case; wage inflation 2%, price inflation 2%, real wage growth 0%, productivity growth 0%. Wage share constant? 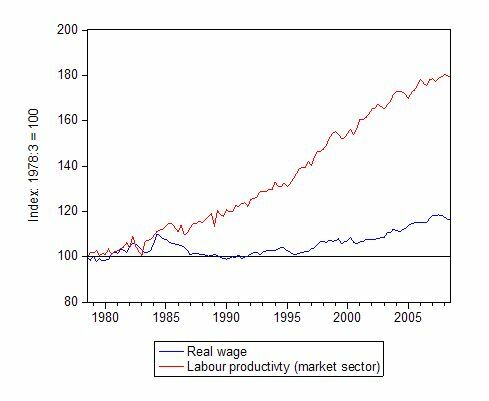 Here is a second case; wage inflation 2%, price inflation 2%, real wage growth 0%, productivity growth 2%. Wage share falling? I follow the discussion and answer to #2, but I have a query over tax and its effect. From one year to the next the effect may be small, but over the time span shown in the graph, the cumulative effect will surely be significant. It complicates the analysis, but isn’t tax also significant in the long run? Or am I not understanding the phrase ‘real wage’ and ‘nominal wage’? Changes in benefits will also have a significant effect, particularly on those paid the least.